Officially, the Xinnanmen Bus Station is the Chengdu Tourist Bus Center, but most locals will know it by its Chinese name Xīnnánmén qì chē zhàn. The majority of their buses go to tourist sites. If you’re looking to hike (Mount Qingcheng), ski (Xiling Snow Mountain), or take in some culture (Leshan Giant Buddha) you’re likely to leave from Xinnanmen. To get an idea of locations, durations, and costs; view this page. But everything is subject to change, so you might want to go to the station and get the details yourself. It’s possible to book bus tickets a maximum of 5 days in advance. If you’re traveling on a Chinese holiday, you can get them 10 days in advance. If it’s not a busy time of year, you’ll likely be okay getting them on the day you want to travel, but give yourself some time to get through the often long lines. If it’s a weekend or a holiday, I recommend booking ahead. Buses aren’t terribly expensive in China. You can expect to pay about $2.50 for every hour you travel. 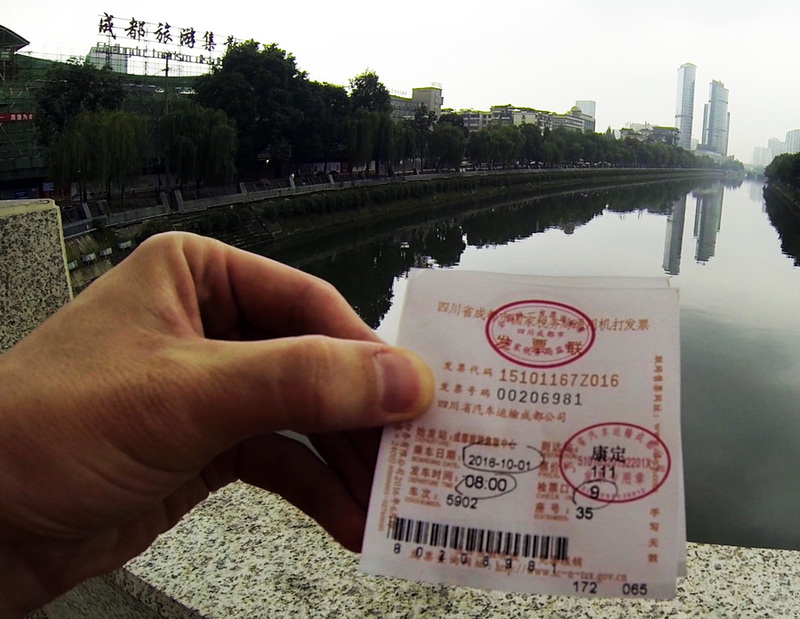 A bus ticket with the Xinnanmen Bus Station in the background. There’s a good chance that the person at the ticket window won’t speak English, so try and be prepared by writing down the location and date (in numerical form) you want to travel. Generally, you’ll be asked where you want to go, what day, what time (usually by showing the computer screen to you), and how many tickets you want. If you struggle with relaying those 4 pieces of information, or if you have a question, they’ll likely dig someone up that can speak English. There are plenty of tourist offices and hotels that will buy bus tickets for you (for a fee), but you can save yourself some cash and have a bit of an adventure by going to Xinnanmen Bus Station yourself and buying the tickets. Location: 57 Linjiang Road – In Chinese it’s called 新南门汽车站 (xīn nán mén qì chē zhàn). Metro line 3 will get you to Xinnanmen Station where you can take exit C right to the entrance.